I have a lot to share this morning, but I am writing an intro to a guest blog post…and so I shall be brief. I’ve got ‘exercise on the brain’ of late. We’re only three weeks away from the beginning of the American College of Sports Medicine (ACSM) Annual Meeting and the coincident 7th World Congress on Exercise is Medicine taking place in Boston, which I’ll be attending. Here at CJSM, we just released our May issue which features a couple of highly discussed research studies: a meta-analysis on physical activity and the risk of lung cancer and an RCT on the effect of rock climbing on low back pain. And to top it off, I’ve ‘met’ Ann Gates, founder and CEO of Exercise Works, aka @exerciseworks for those of you, like me, who have followed that Twitter handle for years. Last week I noticed on that feed an announcement that Exercise Works would hold a MOOC this summer — ‘Physiotherapy, Exercise and Physical Activity’ #PEPA16. And it starts July 4 2016. What is a MOOC you say? What exactly will go on in #PEPA16? #PEPA16? It sounds like a rock group… but it’s a mission. It’s a passion. It’s an opportunity to support health care professionals interested in exercise medicine and disease: from Africa to Afghanistan, doctors to community outreach workers, and to embed physical activity into making every contact count, every consult. So what’s a MOOC, and what’s happening this summer? A MOOC is a massive, open online, course run by expert educational organizations (in this case Physiopedia). It’s also a unique opportunity to learn, participate, contribute, engage, and share on a global scale! The excitement of it all is that the course has been designed and evaluated to deliver high quality learning outcomes on the role of physical activity in health. It provides a global, level playing field, to gain knowledge on the health benefits of exercise and chronic disease prevention and treatment. It’s also the final part (phew!) of my three year project to change the way we educate health care professionals in prevention medicine (in this case using exercise as a medicine). I set out in 2014, to disrupt the way in which physical activity medical education is delivered. I wanted most of all to open up the opportunities to all, and to deliver learning and implementation science of physical activity opportunities, into everyday patient care. We’ve achieved this for doctors and health care professionals in the UK- but I wanted to take this global, and provide educational support for all, in any country, for any health care professional interested in learning more about the benefits of physical activity in health. So, #PEPA16 is the result. A global, online, “rocking”, opportunity to care and share the knowledge, that indeed, exercise is best medicine! Join us, this summer, and please register here. What’s in the #PEPA16 MOOC Resources? The ‘Exercise Works’ Resource Set is a collection of evidence-based slide sets for teaching the benefits of physical exercise in 21 different areas of healthcare, including cancer, stroke, heart disease, mental health and post-surgical recovery. Nearly 30 authors, all passionate and experienced in exercise prescription and chronic diseases, pregnancy, and surgery, developed the educational content. Each week, MOOC participants will complete educational activities and share discussions on what physical activity advocacy means for them , in their practice. Physiopedia is the worlds largest online resource for the physiotherapy profession and the only provider of physiotherapy related MOOCs. They have previously delivered two of the worlds largest open online courses in Lower Limb Amputee Rehabilitation and Physiotherapy Management of Spinal Cord Injuries. Physical Activity is an intervention that all physiotherapists use with their patients. This makes the Physiotherapy, Exercise and Physical Activity MOOC (#PEPA16) ideally placed to educate physiotherapists (and all other health care professionals) globally. So what am I, and Physiopedia, aiming for? On completion of the course learning and activities, all #PEPA16 participants will be in a good position to lead and effect change on physical activity within their own practice. It is hoped that the course participants will become the next generation of “physical activity champions” and advocate and exert influence in all aspects of physical activity, exercise and physiotherapy opportunities. Globally. Exercise Works and Physiopedia, will run the #PEPA16 MOOC on physiotherapy, exercise and physical activity, for 6 weeks, from 4th July 2016. If you would like to join this MOOC, please register here. Anyone can access the course, but the course is primarily aimed at participants with a basic understanding of: healthcare, physical activity, physiotherapy, exercise medicine, public health, community outreach work, health charitable work, or anyone with an allied health care professional background. Exercise Works! was formed in 2011. A key vision for the organisation is to enable all health care professionals to provide safe and effective exercise advice to patients and the public. I’m the founder and CEO, and also key-note speaker, presenter, author, blogger, and disruptive innovator for physical activity advocacy and influence! In 2014, as part of my role as an Emerging Leader for the World Heart Federation, I was asked what I could do to help lead and deliver on the World Health Organisation (WHO) “25×25” goals. 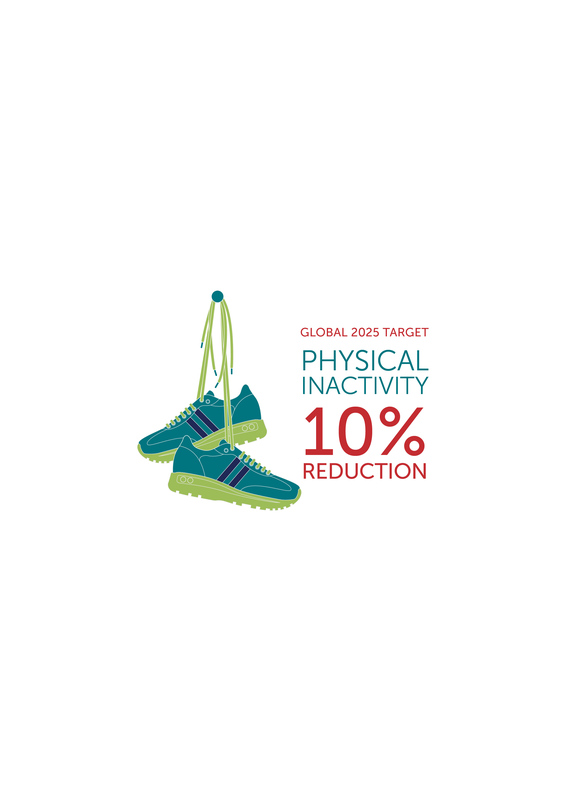 A key element of these WHO goals, is to reduce physical inactivity by 10%, by 2025. My mission was/is to support all health care professionals to contribute to this goal through education, knowledge transfer, the practice of making every contact count, and influencing health care systems and beyond, to create a life course approach to physical activity. On one side of a page, a three year project plan was drawn up. #PEPA16 is the final part of the mission! Phase 1: to provide an educational resource on exercise medicine and chronic diseases for undergraduate medical students in the UK. This project was successfully completed in 2014, with over 15/33 of the UK medical schools using and potentially examining on the resources. Glasgow Medical School became the first UK medical school, in 2016, to exam final year students on physical activity guidelines and patient care. Phase 2: to develop the resources for all undergraduate, student: doctors, nurses, midwives, dentists, pharmacists, social workers and all allied health care professionals. In 2015, over 450+ downloads of the resources had been made by national and international schools of medicine and health. The resources were also evaluated by The University of Nottingham, using a team of over 29 international evaluators and physical activity experts. The evaluation scored the overall resources as 8/10 for quality. The evaluators consisted of physical activity experts, exercise medicine professionals, exercise physiologists, health care professionals with a special interest in chronic diseases, and educationalists. The resources were endorsed for undergraduate use by The Council of Deans of Health, UK. Phase 3 (current 2016-2017): to enable all health care professionals and community health/charity workers, especially in low and middle income countries, to access and use the resources to build the capacity, to deliver change within their own practice, communities, nations and internationally. For this final phase of the plan, Exercise Works has partnered with Physiopedia to deliver a quality, massive, open, online, course! That’s #PEPA2016! And that is happening NOW! Please join us! Thanks so much Ann, and thanks to Exercise Works and Physiopedia for your collaboration on #PEPA16. This project is sure to advance the health and wellness of people around the globe. And thanks for proving the value of social media in sport and exercise medicine. Readers, please take the chance to follow both Exercise Works and Physiopedia on Twitter to stay abreast of future work they are sure to do.